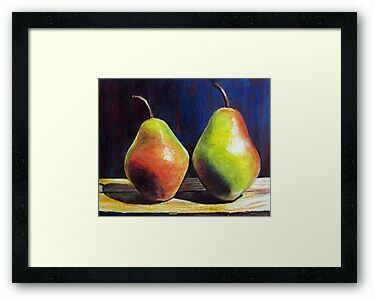 “Pears” is an oil pastels piece done in 2011. The surface is pastelbord, and the size of the piece is 8×10. I really love pastelbord the more I use it. There really is no comparison with pastel paper of any sort. Not only is pastelbord a solid, thick surface, but the actual surface itself is gritty and has plenty of tooth to pick up the oil pastels with. I am pleased with how this piece turned out – the colors are bright and vibrant and I feel that the wood texture underneath worked out well too. Your oil pastel work is an inspiration. Thank you. I look forward to more posts. Finding oil pastel works and information takes some hunting. Soft pastels abound, oil pastels not so much. Thanks again. Hi Eric, love your pastel pears. I will take a gander over to Redbubble to check it out.